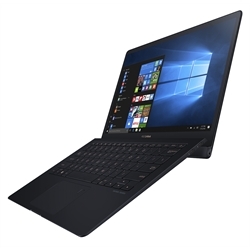 • This product continues to embrace the light and elegant exterior design of the Zenbook series and is the first to adopt the ErgoLift, human-centered design for better cooling and audio performance, and improved keyboard input quality to ensure that the design covers both the practical and aesthetic aspects. • The appeal of this product is on a unique style and outstanding experience; it focuses on young/mature business or blogger customers. Its Clam Slim market continues to grow and the product market has high potentials for development. 1kg light, 12.9mm thin. All-metal in Deep Dive Blue or Burgundy Red, with Rose Gold details and spun-metal finish. ErgoLift hinge auto-tilts the keyboard 5.5˚ for typing comfort with improved cooling and sound quality. Up to 4K NanoEdge display, latest Intel CPUs, 1TB PCIe SSD, 13.5hrs battery life, Thunderbolt 3.